Assault Marines are a mainstay of many of the armies I face, and they messily butcher my Guard at every opportunity so it's a given that I'd add some to the Dark Angels. I didn't want to just bang out a basic squad though, I had plans to do a 'vanguard veterans' equivalent utilizing the Sanguinary Guard winged jump packs. Seemed to me that the wing motif carries through both the DA and the BA, so there's definitely opportunity to pilfer decorative bits from their crimson bretheren. ...And then I got the codex, and found that veteran squads can't take jump packs. Ah well, regular old assault marines they'll be - no sense in letting the modeling idea go to waste however! Once it became clear that they'd just be a vanilla assault marine squad, they were giving the most basic of wargear to keep the points down (unlike the triple plasma-toting tac squad). Bolt pistols and chainswords all around, with the veteran sergeant carrying a power sword. The initial test model I'd built prior to reading the codex became the sergeant model, which worked out well. I'm glad I waited before building the whole unit, that's for sure! Tried to do a little engine glow in the back, though I'm considering trying to add a little OSL to the wings near the upper thrusters. All in all a fun unit to build and paint, and they add a little extra eye candy to the army overall! I love the use of the wings. I have never considered wings for dark angels but it works. Agree, they look very cool. I wonder if the reason veterans cant take jump packs is because their robes would get singed? I can't imagine any of those robes or pieces of parchment, etc survive ten minutes on the battlefield. I like these very much. Nice to see Assault Marines getting some love. 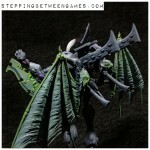 The wings definitely go with the Dark Angels and are perfect for them. too bad the new codex didn't give you some tougher guys to play with the models. but that's okay, assault marines need play time too. I was bummed that the DA vets couldn't take jump packs,but I think Phil hit it on the head - they tried it once and they all caught on fire! Enough of the good guys for now, time for some equal opportunity evil! "All caught on fire" LOL! I can see a battle field filled with chard fallen angels.